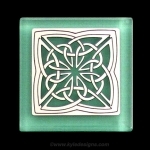 These decorative magnets are available in 100's of Kyle's cool original designs. 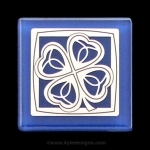 We'll handcraft these strong refrigerator magnets in the color and design of your choice - select from artistic animal, art, flower, hobby, sports, religious, professional, & symbolic designs for a stylish room or office accent that helps keep you organized. 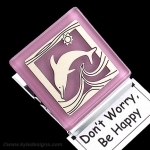 Fun, colorful fridge magnets feature unique etched metal designs and rich glass colors for a practical décor or gift idea! Magnet clips are a perfect organization solution for keeping documents and folders neat, hanging kitchen hand towels, sorting mail or holding your favorite photos on cubicle walls. Functional magnets are also great for school lockers, classroom whiteboards and file cabinets in addition to dressing up kitchen appliances. 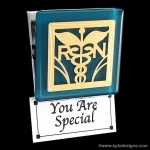 Surprise the special guy or girl in your life with a personalized magnet clip that shows how much you care. 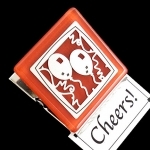 Cool Gift Ideas for Both Men and Women - Organize your home, office or personal space with our multipurpose magnet clips. Sure to add a personal touch to any home decor, these custom magnets are perfect for keeping your space neat and tidy - use on lockers, metal doors, cubicle walls, metal filing cabinets, classroom whiteboards, kitchen appliances - anywhere you'd like to keep an important paper handy. Multifunctional - Strong and sturdy, these clips are can multitask: the strong clip is great for holding calendars, important documents, photos, mail, files, homework assignments, and more, while the top edge of the clip acts as a hook or ledge over which you can lay key or ID badge lanyards, hand towels, scarves, dog leashes, etc. 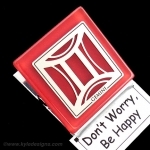 Select a Message Card - Make gift-giving easy with these personalized message magnets. Included with each is your choice of a message card such as Thank You, Happy Mother's Day, Get Well, or Congratulations. More than a dozen message cards are available as well as a blank card for your own greeting. 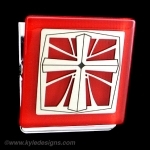 They make a thoughtful and lasting gift for anyone just by customizing to their interests. 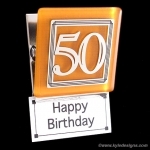 Make Your Own Unique Refrigerator Magnets - Custom select your favorite original design in silver or gold etched metal and striking translucent colored glass or an anodized aluminum accent for a beautiful addition to your home decor. 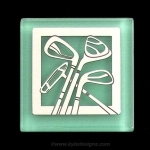 A golf magnet clip and Happy Retirement message card for dad. 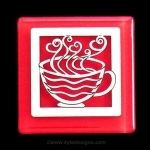 A coffee cup magnet clipped to a Starbuck's gift card with the message Thank You for a favorite teacher gift. 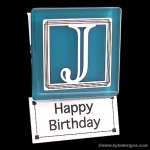 A monogram initial magnetic clip for each of the kids to hold their important school papers on the refrigerator. 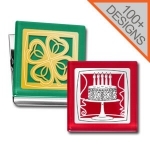 A baking magnetic clip makes a great gift for Grandma for clipping recipes up at eye-level.